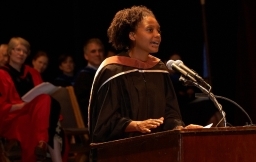 Pulitzer-winning poet Tracy K. Smith addresses 2012 graduates of the Bread Loaf School of English. RIPTON, Vt. — On Aug. 11 at Middlebury College’s Bread Loaf campus, the Bread Loaf School of English concluded its 93rd summer with commencement ceremonies, during which 60 students received master’s degrees. 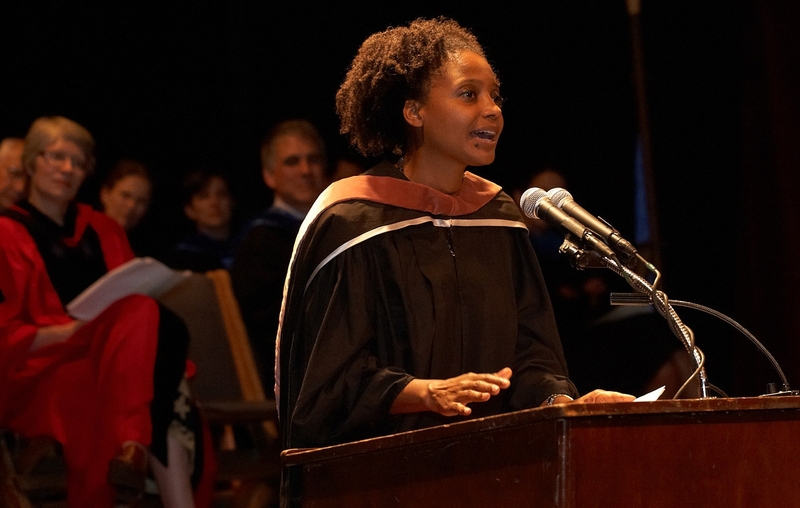 The speaker at the Saturday night event — selected by the graduating class — was Bread Loaf faculty member Tracy K. Smith. Smith, assistant professor of creative writing at Princeton University's Lewis Center for the Arts, won the 2012 Pulitzer Prize for poetry in April for her third collection of poems, “Life on Mars,” published by Greywolf Press. She joined the School of English faculty in 2010, and her poetry workshops are widely praised by Bread Loaf students. Middlebury President Ron Liebowitz confers a degree at the 2012 Bread Loaf School of English Commencement. The “hooder,” who adds the master’s hood to each graduate’s academic regalia during the ceremony, is also picked by the senior class. This year the graduates chose Edward Brown, a member of the Middlebury Class of 1983. He and his wife Victoria, both of whom earned master’s degrees from Bread Loaf in 1989, serve as Bread Loaf Innkeepers during the summer session. Brown is also the School of English’s photographer. This year the school awarded an honorary Doctor of Letters degree in absentia to poet and Bread Loaf friend John Ashbery in recognition of his place as one of the most influential and innovative poets of our era. The author of more than 30 books of poetry, Ashbery has given readings of his work a number of times at Bread Loaf. He has won numerous awards, including the Pulitzer Prize, the National Book Award, the Ruth Lilly Poetry Prize, the Bollinger Prize, and a MacArthur “Genius” Grant. Emily Bartels, director of the Bread Loaf School of English, speaks to graduates. During the ceremony, Middlebury College President Ronald D. Liebowitz conferred 57 M.A.s and three M.Litt.s ― a more specialized degree for which the M.A. in English is a prerequisite. Elisabeth Robert, a Middlebury trustee and a 1978 graduate of the college, led the procession. On July 25, the Bread Loaf Santa Fe campus awarded five M.A.s, and on July 28, eight students in Asheville received their M.A.s. On Aug. 4, 20 students at the Bread Loaf campus at Oxford received M.A.s. A total of 90 M.A.s and 3 M.Litt.s will have been awarded this summer at the four Bread Loaf School of English campuses. With diplomas and canes in hand, the newest graduates of the Bread Loaf School of English conclude their commencement ceremony. Established in 1920, the Bread Loaf School of English is one of Middlebury’s summer residential graduate programs, offering courses in literature and the allied fields of literacy and pedagogy, creative writing, and theater arts. Students, most K-12 English or language arts teachers, come from across the U.S. and beyond for one or more summers of intensive continuing education. Students may also elect to pursue an M.A. or M.Litt. degree in English. Faculty come from eminent universities in the U.S. and U.K. to teach and learn at four distinctive campus sites: in New Mexico, North Carolina, England and Vermont.